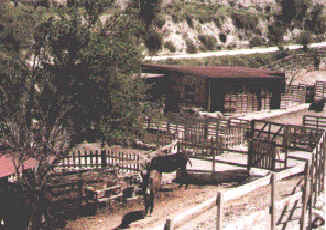 Part of the main site, which accommodates 70 donkeys showing stable units and exercise yards. Building at this site only started in June 1996, when the first unit was prepared for the arrival of donkeys from a closed sanctuary in Crete. The sanctuary is entirely dependent upon private donations and income from visitors, mostly British residents and their families, and tourists from Britain and other countries. Volunteers help care for, feed, and walk donkeys. The residents are always pleased to see a visitor, especially those with carrots. 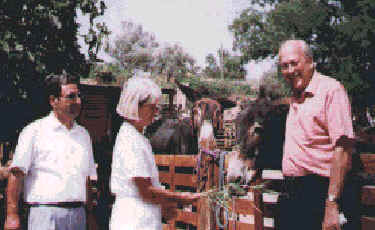 "Friends of the Cyprus Donkey", is a registered Cypriot non-profit charitable association, started in October 1994 by Mary and Patrick Skinner in Vouni village, when their original family of "pet" donkeys had suddenly developed from three to six. In October 1995 there were 17, a year later 37, in October 1997, 57 and today more than 80. All animals are elderly, frail or simply unwanted, but they form part of a rapidly disappearing part of the heritage of Cyprus. From a small private endeavour run by the Skinners, with some help from friends, has developed a growingly efficient animal care organisation with full-time carers, a rota of volunteers, weekly farriery sessions and consultant veterinarians. A service of advice, medical and foot care is also offered to owners of donkeys not in the Vouni sanctuary. All this requires an income of at least ST£7,000 per month to meet day-to-day costs and the development programme required to take in more animals. "Income comes through many channels", says Administrator Mary Skinner, "We have over a thousand members who pay an annual subscription. Hundreds of children "adopt" a donkey for £5,00 a year. There are a number of generous donors and we also have as many as a thousand visitors a month, who help us financially and buy merchandise from our shop, which has a growing range of good quality products for gifts. Nevertheless, because we are growing all the time, we urgently need all the help we can get: financial; peoples' time, and all kinds of materials". Animals are resident on four sites. Two are not far from the Skinners' house, "The Home Site". One, with 15 animals is the "Intensive Care Unit" for old and frail animals. Half a kilometre away is "The Stena Site", on which more than 80 donkeys now reside. At Stena are the Association's shop, refreshment facilities and picnic area. More land in the Stena area and elsewhere is being rented to cope with the arrival of more unwanted animals. Visitors are welcome from 10.00 a.m. to 4p.m. every day, except Sunday, but in view of the calls upon the staff and helpers, they are requested to phone first to arrange their visit. Groups are very welcome and special programmes can be arranged. 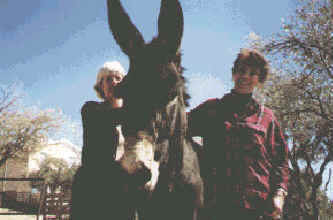 Administrator of the sanctuary, Mary Skinner (left) and President of Friends of the Cyprus Donkey, Kate Clerides, the daughter of an ex President of the Republic of Cyprus. 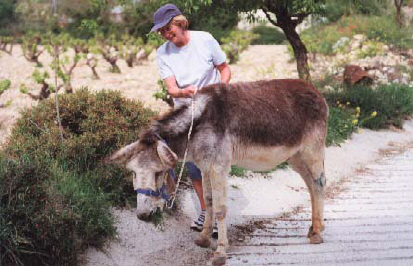 The Association was run by a Cypriot-British committee of seven committed devotees but was taken over in 2007 by a Devon based Donkey sanctuary. Today, there are more than 120 donkeys resident at the sanctuary at Vouni. The donkeys are accommodated in twelve units, each unit containing about 10 donkeys. Units 1, 2 and 9 are at the "home" site, near the house of Mary and Patrick Skinner, and Units 3-8, and 10-11are at an area called Stena about half a mile away. Stena is now the headquarters of the sanctuary, with a visitors centre, comprising shop, lavatories, a facility for drinks and other refreshments, and a picnic area. Units 1 and 2 are reserved for the accommodation of very old animals and those requiring special veterinary care. Units 3 - 8 are for the younger, fitter animals who are grouped according to age, size and condition. The animals come from all over the island. All of them are unwanted for a variety of reasons. Some are too old to work, or their owners are too old to work them. Sometimes an owner dies or is ill and there is no-one prepared to take care of the donkey. In many cases, a machine is now doing the job that the donkey used to do. It is the aim of Friends of the Cyprus Donkey to give these unwanted animals food and shelter and, when necessary, veterinary care and to make their lives as comfortable as possible. All animals are routinely vaccinated against tetanus and treated for internal and external parasites. All animals receive regular visits from our farrier for routine or specialist treatment of their feet and teeth. There is an active re-location and "re-homing" programme, which has resulted in nine animals being re-sited to date. The sanctuary welcomes many thousands of visitors every year, from all over the world. In this picture, from left to right: Dr Clitos Andreou, Deputy Director of Cyprus Veterinary Services; Mary Skinner and Mr Peter Davies, Director General of the RSPCA. 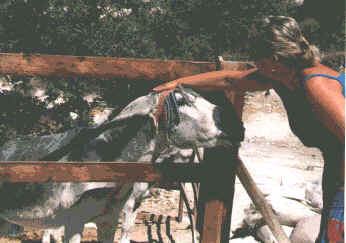 Friends of the Cyprus Donkey - Sanctuary in Vouni. If you want to ride whilst in Cyprus, see our Cyprus Riding Holidays for the Limassol area or Horse Riding in Paphos or if you are staying up in the Protaras area then there is the Horse Riding section for that area and those in the Larnaca area may use this.